Those designers at Google Creative Lab sure don’t fool around. Well, actually they do — pretty much constantly — which is how they come up with ideas like The Cube, an interactive storytelling platform that allows an online film or video to unspool on all six sides of a virtual cube at the same time. The idea is to take that two-dimensional rectangular box we usually use to watch video onscreen, and bump it up one dimension into a 3-D cube. 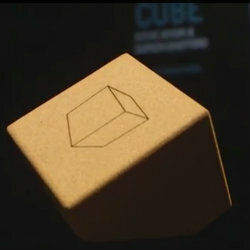 By using a handheld cork cube as a controller, viewers can flip the onscreen cube to watch different scenes, each unfolding concurrently. Writers and directors could therefore construct stories with six parallel narratives playing out simultaneously. The audio is synchronized with the Cube’s movement so that only sound from the side currently in view can be heard. The Cube made its debut last week at the Semi-Permanent festival in Sydney, Australia. In the demo installation, viewers controlled a giant onscreen cube showing scenes from a specially commissioned short film written to the accommodate the format of six-sided storytelling. Among the characters in the short film: Mean Teen, Big Business Woman, Sliding Man and Mustache Man. I don’t know, this seems relevant. The technology is designed to be experienced online, on a smartphone, or in a dedicated installation similar to the Sydney festival. Google hopes to release the Cube as a kind of sandbox app for creators in the coming months. So if you’re interested in next-gen storytelling, maybe it’s time to go buy one of those screenwriting books. Or six of them.